Posted on August 4, 2017 by Elizabeth E.
…and shows my package (including little book, above) that was sent off to the person in line next to me, the idea being a circle — from one to another to another, roughly every month. 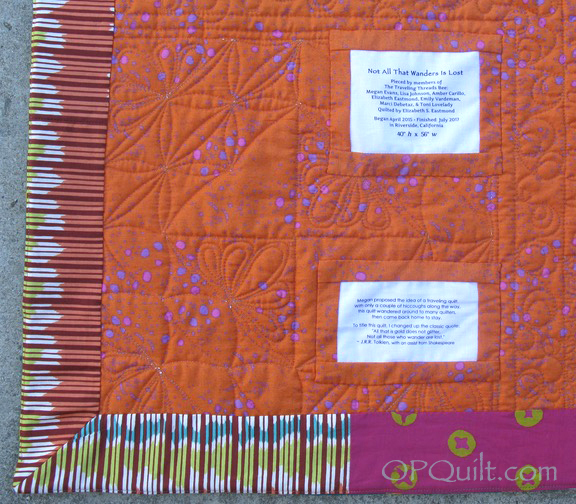 Monthly was probably too ambitious, and at one point my package skipped a quilter because of time pressures, so in the end I had six lovely quilters make a block (or blocks) for me: Megan Evans, Amber, Emily V., Marci Debetaz, Toni Lovelady and Lisa Johnson. Our group on Instagram was #travelingthreadsbee and we all made such different quilts (click on their names to see their groups of blocks). I love that it is a meeting of far away and close, new and old, friends. 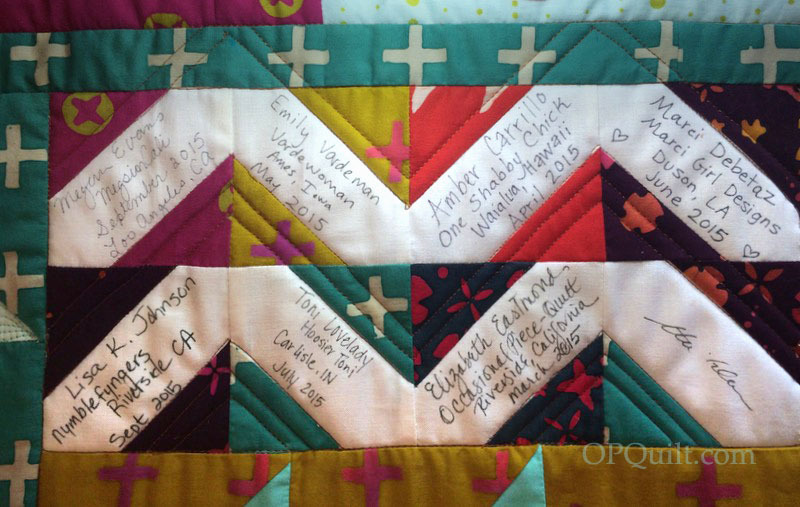 I put my signature blocks on the front of the quilt, and in the lower right is the signature of the fabric designer, Alison Glass; all are contributors to this quilt. I put the label and a statement about the quilt on the back: I liked the idea that the quilt wandered, and then came home. 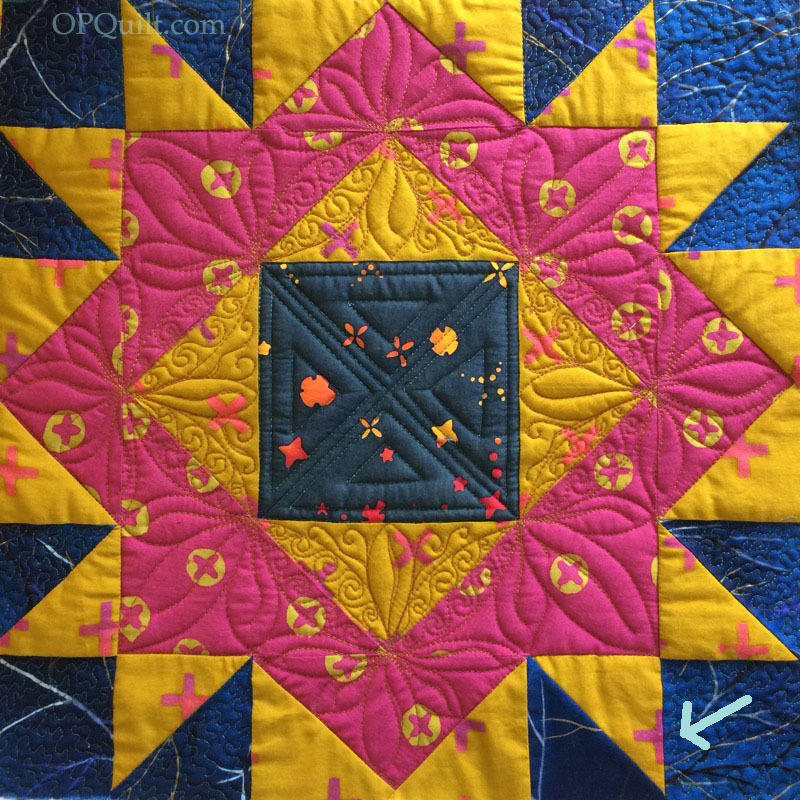 This was the first project I started quilting this spring, using its beautiful qualities to help propel me back to my groove in free-motion quilting. I posted each block on my Instagram feed as I finished it. 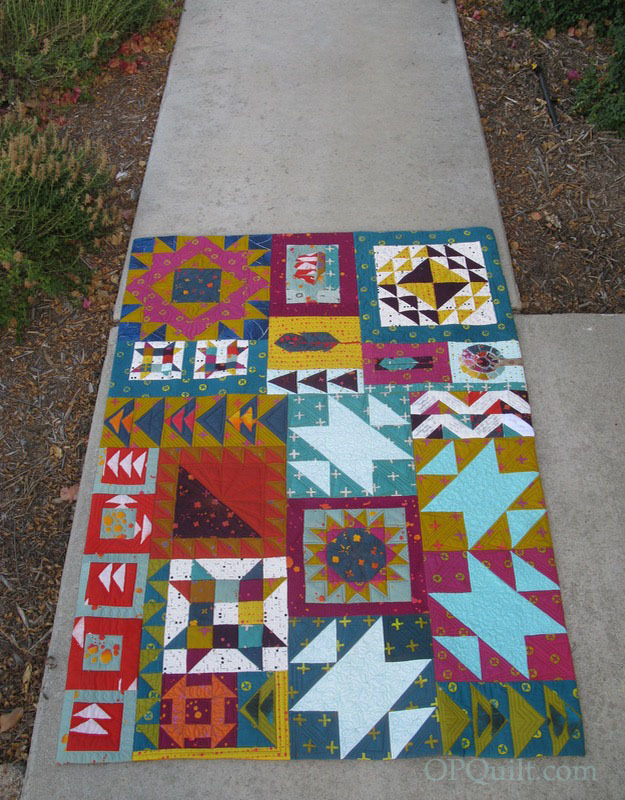 I took it on the back patio, in the setting sun, so the slanting rays could amplify the quilting lines. Luckily I caught the un-quilted section (blue triangle) before finishing it up with a faced binding. I like to put that invisible binding on busy quilts, as it gives a clean finished edge (tutorial is *here*). Okay, it’s the OPQuilt Summer Book Giveaway Time. I took this photo from their site, a fun place to go and read and get great ideas for all sorts of homemaking-type projects. Their tagline is “Two girls. Same name. One mission. Teach the world to sew.” and this book is a great example of terrific projects made simply, with a lot of pizazz. To enter the giveaway for this book, please leave a comment below. I’ll let it run for a few days then I’ll notify the winner by email. By the way, this is a signed copy (both authors!). Posted on July 28, 2017 by Elizabeth E.
It was time. When I last made hot mitts, it was 2013 and now, many hot pans later, I was in desperate need of new hot mitts. Scary picture of old mitts, below. I made it really small so you wouldn’t faint. DON’T DOWNLOAD THIS for pattern! So I looked up my tutorial about when I first made these oven hot mitts. I printed out the pattern at 100%, checking that picture of the ruler to make sure it matched 1″ on a real-life ruler. I taped the two parts together (shown above…again DON’T use that photo as your pattern!–refer to the tutorial), and set them aside.. Layer up the fabrics, according to the directions in that original post. I chose my thread, using a variegated So Fine for the Amy Butler floral, and quilted the fabric layers together by just scribbling and swirling all over it. I’ve also used my walking foot and done straight lines. It really doesn’t matter what you do; just get those layers secured together. I cut out enough for two mitts: that’s four hand-shaped pieces. Remember to reverse the pattern when cutting a pair (as shown in the top photo). Then it was make bias binding time. I now have some handy-dandy new hot mitts. Reminder: they are a little big until you wash them a couple of times. I built in that shrinkage to the pattern. Mitts in action. Recipe is my go-to Summer Pasta Salad, found on ElizabethCooks.com, my recipe blog (see below). Now I can cook in style. The ongoing OPQuilt Summer Book Giveaway is still going on: you get a new book and I get more shelf space in my sewing room. Here’s the total stack of books I’m giving away. The first two titles are lined out as they are all finished, and next up is the Denyse Schmidt book. I’ll let this one run until August 3rd, and will notify the winner by email. I’m letting you know what is coming up so you can either enter all the giveaways, or just the one you want. I’m still very happy to receive your comments, though! This week’s Intentional Piecing has been given, in accordance with the strict rules of the Husband Random Number Generator, to Andrea in Florida. The penultimate Four-in-Art reveal for 2017 is coming up on Tuesday, with the Challenge of Stained Glass. 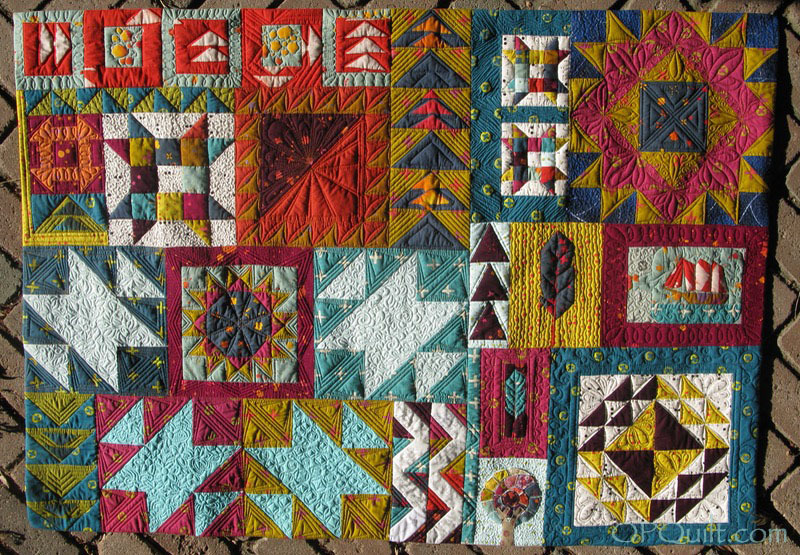 Join us all then to see the quilts our group makes. Leave me a comment below to enter the giveaway for this week. Posted on July 20, 2017 by Elizabeth E.
I recently posted about taking a break from the creative world, from the quilty world, from whatever and while I was gone, I had some to time to think about how I’d gotten to that non-creative place. I’d say, for me it was a factor of four: Time, Health, and Mental/Physical Fatigue, as well as a Too Much to Do. My Dad used to say “Too many irons in the fire put out the flame.” While a reference to the bars of iron that blacksmiths use, I did have too much going on. I was intrigued with the idea of Creative Block, and one article “7 Types of Creative Block and What to Do About Them,” from my favorite place online (99U) discussed this issue, that apparently is a very-much-real thing. In that piece, I liked the sub-topic of Work habits that don’t work, as I have been struggling to (re)learn three new computer programs: EQ7 (I learn it, then forget it, and there’s so many hurdles with the design of this software…but then that’s another post), Affinity Photo (to replace Photoshop) and Affinity Designer (to replace Illustrator). Three more irons in that proverbial fire. 99U’s advice to “[s]tep back and take a good look at how you’re working, and where the pain points are….If you don’t have enough energy, are you working at the right time of day? If you feel paralyzed by freedom, introduce more structure and order into your day. If you feel constrained by routine, find room for improvisation” felt like it was just for me. Thanks to all of you who wrote and left comments on my last post. We headed out that day for a family reunion and I left the keyboard behind, but I read them all and appreciated your encouragement. I’m slipping back into the creative life, one stitch at a time. Because who knows what might spur your creativity, I’ve got some books to give away. If what I’m giving away (this will go on, erratically, for several posts) tickles your fancy or appeals to you in some way, if you leave a comment, please let me know you’d like to enter the giveaway. Some of the books are ones I’ve purchased and read, and no longer need; others were publisher giveaways at Quilt Market, and it’s time to pass them on. The first one is Lines by Design by Debbie Grifka, a lovely book on how to make elegant modern quilts. Good luck! Giveaway will close in a few days and I’ll contact the winner by email and get it sent out.